This mid-century chair has amazing lines but was in rough shape. It was manufactured by Kroehler and designed by Avant Designs from the 1960s. 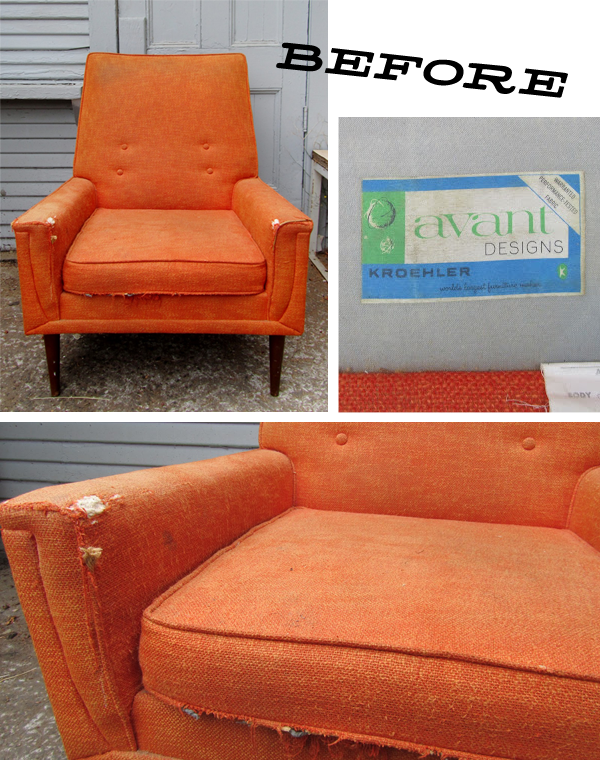 It's original orange fabric was shredded and had that familiar musty smell. I found this newspaper clipping online from The Morning Record in Wallingford, Connecticut on September 24, 1965. 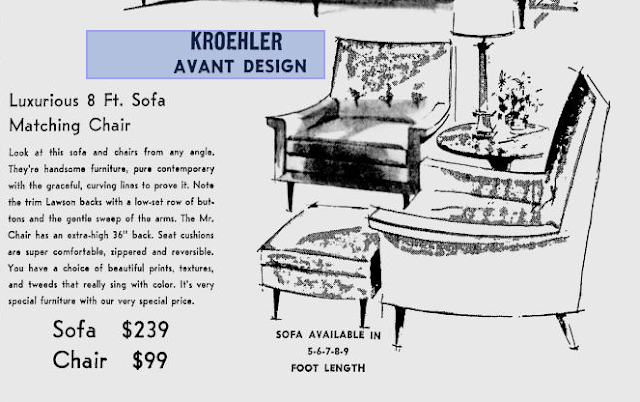 The chairs listed are by Kroehler Avant Design, not the same chair here, but very similar lines. I love seeing these old ads! We picked out some amazing avocado green fabric and went right to work on it. It took a bit more work than anticipated, it is finally finished and we are looking to give it a good home. SOLD. If interested please reply to remnantpdx at gmail dot com. Hello, I have a (Very similar) Avant chair with ottoman (same green even), as well as a (kinda) burgandy one, and the matching sofa (in a deep yellow)... I have a lady coming Sunday to maybe purchase the set, can you give me Any Idea what the set would be worth ??? I also have the rest of a 2 bedroom apt. that was Completely Full of Mod. Mid-Century furniture, also included is items like a 5 pc. bedroom suite made by Drew ... Can you tell me where (other than ebay), that I could find "today pricing" for this type of furniture ??? I would Truly Appreciate Any Help, that you could give !!! P.S... In case you might be interested, I have like 40 plus pic's !!! (863) 967-3496 !!!!!!!!!! AGAIN, THANX !!!!! !